Every homeowner knows that feeling of pushing the button on their remote and getting no response from their garage door. It’s inevitable that after many years of consistent use, some or other critical part will break. Most of the time, it’s the springs that are blamed, but garage door openers bring their own set of challenges that a professional can help to fix. Our company has built a solid record of quality and trustworthy service, which has won us customers throughout the Williamsburg area and our friendly staff is always ready to lend a helping hand. For relatively small electronic devices, garage door openers do quite a remarkable job of lifting a door that could weigh hundreds of pounds, day in and day out. You can never predict when the gear on your belt-driven opener will grind to a halt, or the belt itself will snap. And who needs to struggle with replacing a chain and cable assembly on a chain drive opener mechanism? You can rely on the expertise of our trained technicians to know how to solve these and other problems that you may experience with any type of opener. We only work with market leading and reputable brands such as Liftmaster, Genie, Chamberlain, and Craftsman. 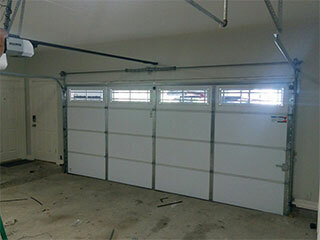 We also offer a full installation service for new or replacement openers. Irrespective of the type, make, or model, all garage door openers have one thing in common - they all have a starter capacitor to get the electric motor going. Owing to corrosion, overheating, or excessive use, this small cylindrical part can fail. And if you hear your opener making a whirring sound with no movement from the door, or smoking, it’s most likely caused by capacitor failure. We’re ready to assist you by safely replacing your opener’s damaged capacitor to restore the full functionality of your door. It’s not uncommon, after a few years of use, for your door to do a starting and stopping motion when it’s being opened or closed. This irritating bouncing movement shouldn’t be ignored because if left to continue, it could become a bigger problem. If your door is regularly maintained, this can sometimes be prevented. But if you’re unfortunate enough to have this problem, get our experienced garage repair technicians to take a look at what is causing it. Chances are it’s due to the opening mechanism having an obstruction in the belt, or the chain needing some oil, tasks which we have the right tools and skills to do. Don’t hesitate to call us today!